If you’re looking for that perfect spot for afternoon tea, look no further than the Garden View Lounge at Disney’s Grand Floridian Resort & Spa. The lounge serves British-style Afternoon Tea packages daily, which you can enjoy while looking at the beautiful outdoor gardens through the windows. Afternoon Tea is offered from 12:00 Noon to 4:00 pm daily. 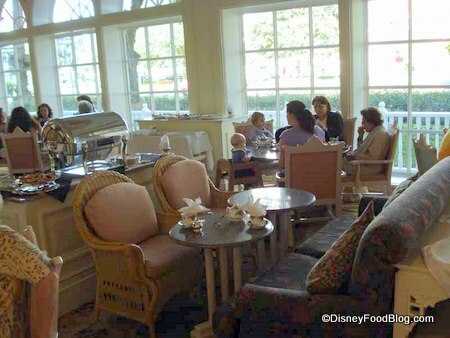 Read about Afternoon Tea at the Grand Floridian here. The menu features full afternoon Tea Packages with sandwiches, scones, and desserts, and more. Advance Dining Reservations are highly recommended. Tea Packages for adults start at $35.00 (and Mrs. Pott’s Tea is available for young guests). Afternoon Tea is offered from 2:00 – 5:00 pm on Sunday, Monday, Wednesday, Friday, and Saturday, and from 12:00 – 5:00 pm on Tuesday and Thursday. Interested guests can make an Advance Dining Reservation via the Disney World website, or by calling (407) WDW-DINE. Be sure to join our DFB Newsletter to stay on top of ALL the news about dining in Disney World!